Ever since the news came that WMS Gaming had secured the licensing rights to the Monopoly brand from established slots developer IGT, we have been waiting for the Scientific Games subsidiary firm to stamp its mark on the Monopoly series. Yes, we were given a taste with the lacklustre Monopoly Big Event that WMS launched in partnership with developer Barcrest but this is the big one we wanted to see. Super Monopoly Money is a 5 reel, 25 payline slot that has all the aesthetic wonders of a WMS Gaming title. The style of the reels and the spin buttons will make fans of WMS feel that the Monopoly series has come home. Stylistically, it is a good start but if we look deeper, does this slot fulfil its true potential? The symbols on the reels are typical of a Monopoly-themed slot. There are quite a lot in fact. The important symbols include the Wild, Free Parking, Bonus, MM Bonus, MM Wild, and Jackpot symbols. On top of these, there are also the Mr Monopoly, rich man, dog, coach, taxi, pot of cash, classic car, battleship, shoe, and top hat icons. To Monopoly or Not To Monopoly? I'm not going to lie. You will not be surprised to hear that this Monopoly slot is a little complex to get your head around. If you're not a massive Monopoly fan or have not experienced previous Monopoly incarnations from IGT such as the superb Monopoly Here and Now slot or the mediocre Monopoly Dream Life slot then you might get lost. Do not fear! You will get used to it. The first thing you will be pleased to find is the plethora of bonus features that can be triggered on this slot. The first of these bonus features is the Free Parking Bonus. 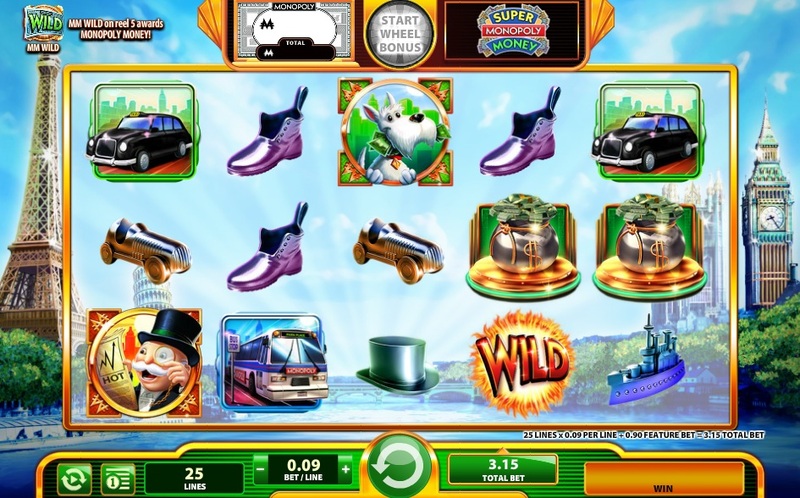 If you hit Free Parking symbols across the reels and it either triggers a win, the free spins, or increases existing wins then you will be given the chance to pick from a selection of hidden symbols. The symbol that is then revealed by your pick will replace all of the Free Parking symbols that appeared on the reel on that spin to create the chance to hit a lot of winning combinations. The Free Parking symbols only appear on reels 2-5. Free spins fans will be delighted to hear that if you hit three or more Bonus and/or MM Bonus symbols across the reels it will trigger the free spins bonus round. It is possible to trigger up to 15 free spins here. In addition, if you trigger the free spins with an MM Bonus or MM Wild symbol then any wins hit during the free spins will be converted into Monopoly Money as well as a real cash payout. 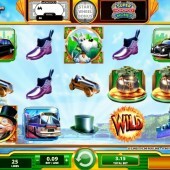 During the free spins, the Wild symbol substitutes for all other symbols except for the Bonus and Free Parking symbols. The Wild also has a more influential role to play than it usually does on other slots. If the Wild appears on reel 5 then it will expand to fill the reel and acts as a Wild for all other symbols except for the Free Parking symbol. If the MM Wild appears on reel 5 then on top of the mandatory cash reward, you will also be given the equivalent reward in Monopoly Money. If the MM Wild appears and there is no win triggered then it will randomly reward up to a 100x multiplier in Monopoly Money. Monopoly Money can be accumulated over a number of spins until you reach the maximum value. Once you've earned enough Monopoly Money, the Wheel Bonus symbol will light up on the reels and you will have the chance to click the button and begin to play. You can spin the wheel by clicking on Mr Monopoly. You also have the option to press “Cancel” and return to the base game or “Cash Out” and return to the base game with the prizes you've won. This opens up a mini-game within Super Monopoly Money with different features filling up the sections of the wheel. The Chance Bonus gives you the opportunity to pick one of three Chance cards to reveal either up to a 10x multiplier or a Go! Re-Spin where up to a 100x multiplier can be earned. The Community Chest Bonus allows you to choose one of twelve Community Chest cards to reveal either up to a 12x multiplier or an Award All prize that pays out the multipliers of all 12 Community Chest cards. If you land on the Community Chest Bonus during a Go! Re-Spin then a multiplier value up to 50x can be triggered. There is also the chance to land on a solitary Go! Re-Spins section of the wheel where you can earn up to a 200x multiplier. Obviously, the more Monopoly Money you accumulate during the base game, the more potential for big wins you have on the Wheel Bonus. The Green Hotels and Red Houses are Back! In a nice little inclusion that is a nod to the Monopoly board game series, if you fail to win on a spin then it is possible to earn Monopoly Money with either the Monopoly Money Hotel that awards up to 100 Monopoly Money notes or the Monopoly Money House that rewards up to 25 Monopoly Money notes. Can't fault having the green and red blocks around! Super Monopoly Money is a much more enjoyable slot than the Big Event title. It is as if WMS had free reign and were not restricted by the Barcrest vision on this game. It's very tricky to get your head around. I was playing this for a good couple of days before I even understood what was going on but once you get into it, the fun is really there to be had. It feels like quite a tight slot in spite of the copious amounts of bonus features included which is a little frustrating but this is a slot that WMS have generally delivered on. Was there any doubt?